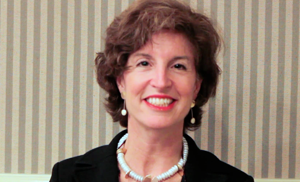 The Enneagram is a powerful tool for personal and collective transformation. Stemming from the Greek words ennea (nine) and grammos (a written symbol), the nine-pointed Enneagram symbol represents nine distinct strategies for relating to the self, others and the world. Each Enneagram type has a different pattern of thinking, feeling and acting that arises from a deeper inner motivation or worldview. The Enneagram fosters greater understanding through a universal language that transcends gender, religion, nationality and culture. While we are all unique, we share common experiences. As representatives of each type tell their personal stories in the Narrative Tradition, we see that the ways people meet life’s challenges and opportunities fall within the nine personality types. Determining our personality type through the Enneagram does not put us in a box, but helps us see the box from which we experience the world. With this awareness, we can step outside of our limited perspective. Ideally, personality is an effective way to express ourselves, but challenges arise when our point of view becomes rigid and we get stuck in automatic habits. By discovering these unconscious patterns, we can lead more fulfilling lives, enjoy healthier relationships, and connect to our true essence. Each Enneagram type has a home base in one of the three centers of intelligence – head, heart and body – that shapes our way of being in the world. Even within our own type, one of the three instinctual subtypes – self-preservation, one-to-one (sexual), and social – influences how we express ourselves in the world. The diagram itself indicates the pathways that each personality type tends to follow during shifts of awareness and behavior in our daily lives. As we move around the circumference of the circle, our relationship to the Enneagram types on either side, known as wing points, further affects our type structure. The lines connecting the points show where energy flows in times of stress and security. 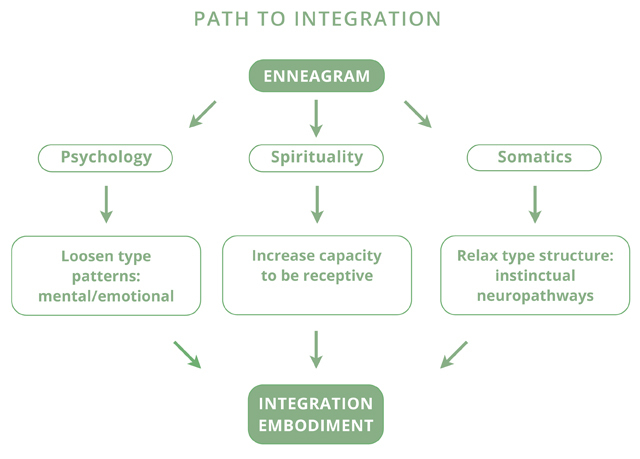 The Narrative Enneagram focuses on three crucial aspects of personal development: psychological, spiritual and somatic. We can work on each of these three elements separately, and there is much value in doing so. That said, using the Enneagram as a map in all these areas creates a synergy that greatly increases the effectiveness of personal growth work. The diagram below summarizes the interrelationship of these elements.